This is absolutely the cheapest way to get a scalloped fretboard Strat. For those of you that have always wanted to try out a scalloped fretboard Stratocaster but didn't have the cash to do it, trust me, you can afford this one. 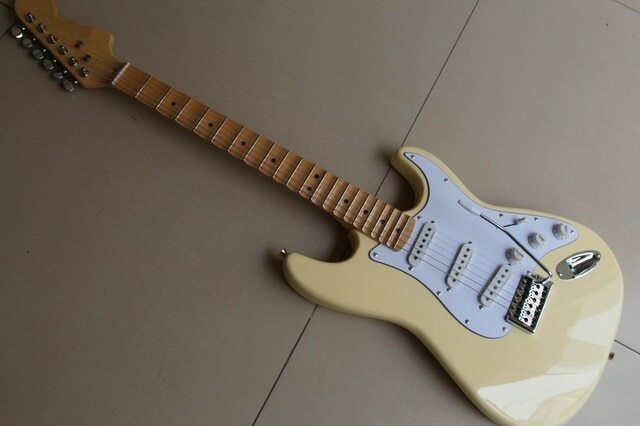 Is it a China copy Stratocaster? Of course it is. Will the guitar need some work once you get it? Probably. But even if it does need work, remember, you're getting the scalloped fretboard. Put in really basic terms, the neck alone is worth the price you pay here. Should Squier be offering a scalloped fretboard Strat? It's painfully obvious that you can order up Asian built guitars with scalloped fretboards for cheap. Most if not all Squier guitars are Asian builds. I'm not even asking Squier to make a Malmsteen model. What I am saying is that they should offer something with a scalloped fretboard on it. Fender has a lot of freedom of design where the Squier brand is concerned, so if they wanted to, they could totally put together a Strat with an HSH pickup configuration and a scalloped fretboard. Alas, there isn't one. Until Squier starts offering a model of Strat with a scalloped fretboard, your only choice is to get one here.